Longboard bearings have improved drastically over the years. There was a time when clay wheels were the only option. That is no longer the case. Now, skateboard bearings allow wheels to spin freely without the burden of unwanted friction. As long as you maintain your bearings and make sure that they do not have water or dirt in them, they should last a long time without having to be replaced. Avid longboard riders will always have a spare bearing or two just in case they need to make repairs during an emergency. When it comes to looking for the best longboard bearings, there are certain factors that you need to take into consideration. The first is your budget. It is not necessary to break the bank in order to get high quality bearings. Even bearings that are not ABEC rated can be durable and last for a long time. Bearings that are well-maintained and kept free from water, sand and debris, will last longer than those that are not well-maintained. To that end it is best to look for bearings that have removable seal/dust covers that you can maintain. One of the criteria that people use when trying to identify the best skateboarding bearings is the grades given by the Annular Bearing Engineering Committee. This organization grades bearings based on a set of standards for the manufacturing tolerances of bearings. 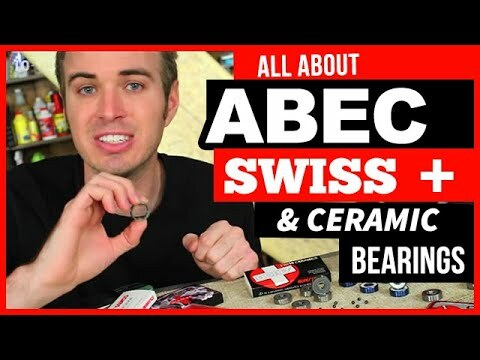 The lowest rating that bearings can get is an ABEC 1. The highest grade available is ABEC 9. There are many factors that go into determining the grade that bearings get. One of the most important factors is the eccentricity of the tract in the inner ring of the bearings. A bearing that has the lowest rating will have a maximum allowable eccentricity of about 0.0075 millimeters. Bearings that have an ABEC rating of 9 will have a 0.000047 maximum allowable eccentricity. While the difference between a bearing that is rated 1 and a bearing that is rated 9 does not seem to be that big in high-speed, high precision machinery, these small variations in measurements make a huge difference. However, when it comes to bearings in skateboards, there is virtually no difference in performance between a bearing that is rated ABEC 1 and a bearing that is rated ABEC 9. The reason for this is that after an individual uses a skateboard for between 5 to 10 minutes, the track in the inner ring will no longer be eccentric. They will start to become irregular because of how they are being used in the skateboard. Within just a few minutes, it will be impossible to distinguish between the highest grade bearings available and the $.75 cheap bearings that are available for skateboards. A well maintained, inexpensive bearing will function better than an expensive bearing that is poorly maintained. To get the most speed out of your bearings, it is important that you use a high quality oil lubricant. A heavy lubricant will increase the life of the bearings. A lighter lubricant, like oil, will make the bearings run freer. Also, the quality of steel used in your bearings makes a difference. High quality steel equals better performance. It is recommended that individuals stick to well-known manufacturers and well-known skating brands. These bearings are trusted and beloved in the skateboarding industry. Equipped with noncontact removable rubber shields that allow easy cleaning and minimize friction and a high-speed nylon ball retainer that increase both the strength of the bearing and speed, these bearings are perfect for anyone looking to cruise the street on their longboard or bomb hills at maximum speed. Users often comment how these bearings are the best ones that they are ever used on their longboards. Their precision grade Swiss design, nylon ball retainers, removable rubber shields and a lifetime warranty against manufacturer’s defects are some of the reasons why Bones Original Swiss Competition skate bearings has been on the top of everyone’s list since they were first introduced in 1983. Individuals who have used these bearings have commented on the fact that they are thoroughly satisfied with these bearings because they are resistant to normal wear and tear, and once they are broken in, they are incredible. Because of their high quality and attention to detail, Bones Original Swiss Competition skate bearings have developed a brand loyalty unprecedented in the industry. If you are looking for a special bearing that is going to give you the perfect mix of speed and durability, you need to look no further. Using a patent pending design and relying on fewer, larger, stronger balls than ordinary bearings, Seismic 6-Ball Tekton Bearings are in a class all by itself. Dubbed the fastest bearings, it has been designed to provide less friction, quick acceleration, and allow the rider to achieve higher speeds. Equipped with removable rubber coated steel seals, DuPont engineered nylon retainers, and a high quality lubricant, these bearings promise to get riders to speeds that are just not possible with other bearings. Having a 4.6 rating on Amazon and a whole host of positive reviews is proof that these bearings are truly something special. These are great bearings at a great price. Packaged in a reusable tin can, these bearings come in a wide range of colors from green to purple. These bearings are built for speed and for fun. Building on the strong reputation of the Penny Skateboard company, these bearings are built with high quality materials. Users comment on the fact that they had a smooth ride and were able to achieve high speeds using these bearings. Those are a few ideas of some of the bearings that are available on the market. Remember, in order to get the best out of your bearings, you must take care of them. Keep them dry, keep them away from sand, keep them away from debris and make sure that they are well lubricated. If you do this, you are guaranteed to have many days of happy cruising.